The opportunity to craft the interior of a previously untouched penthouse is on offer at Potts Point. For sale by Darren Curtis and Ken Jacobs of Ken Jacobs Christies Double Bay. 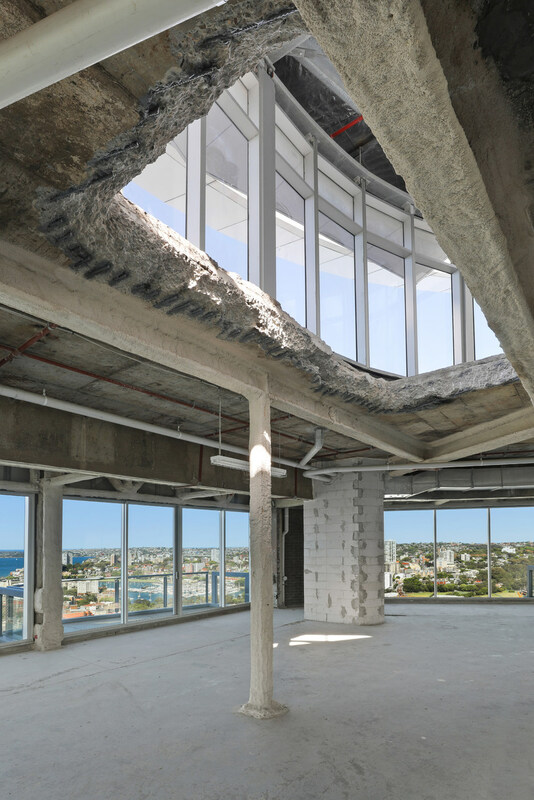 The penthouse features 360-degree views. The top floor of the building has never been occupied. The view from the penthouse verandah. Zenith is defined as either the time at which something is at its most powerful, or the point in the sky or celestial sphere directly above an observer. In the case of the penthouse at 82- 94 Darlinghurst Road, Potts Point, it could easily be both. Sitting atop Zenith Residences in Sydney’s most iconic and diverse hub, the 582- square-metre space represents the ultimate blank canvas. It has remained untouched not only throughout the existence of the apartment block, but also in the building’s previous life as a hotel. Ken Jacobs Double Bay, Christies International agent Darren Curtis told WILLIAMS MEDIA the penthouse’s availability was an opportunity to construct its identity. “It’s unusual to come across a space like this that has no influences or marks made and I think the ultimate buyer will be someone who relishes the chance to create,” he said. Consisting of 414 sq m of internal space and 168 sq m of terrace space, the penthouse occupies the entire top floor of the building. Mr Curtis said the broad scope of space offered was reflected in the 360-degree views spanning from its enviable position. “I sold some incredible apartments and penthouses in the 13 years I have been at Ken Jacobs, but I have never seen one with such a genuine 360-degree view,” he said. “There’s the Opera House and Harbour Bridge on one side, and then landmarks such as the Sydney Cricket Ground on the other. The location does not come at the cost of convenience, with a Coles supermarket at the bottom of the building. Residents at Zenith also have access to a 24-hour concierge. See more of 82-94 Darlinghurst Road, Potts Point, including additional photos and floor plan, visit Luxury List. For an expression of interest, phone or email Darren Curtis or Ken Jacobs of Ken Jacobs Christies Double Bay.